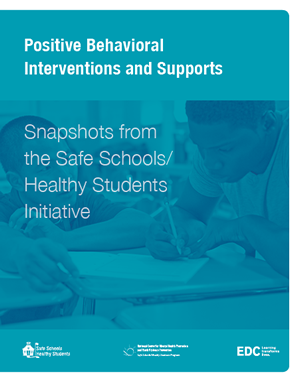 Positive Behavior Interventions and Supports (PBIS) is an evidence-based model that provides a schoolwide approach to preventing and improving problem behaviors and creating a positive school climate. Successful PBIS practice requires practitioners to adhere to its principles and to be adaptive to audiences. Its messages may be tailored for individual schools, different age groups, and different settings within the school. The adaptability of PBIS also allows for innovation.This Snapshot explores how Safe Schools/Healthy Students sites implementing PBIS trained parents and youth-serving professionals to reinforce PBIS messages with students outside of school. Partnerships between schools and other community organizations also bolstered PBIS by providing wraparound services for youth in need. Read about communities that implemented the PBIS curriculum and saw improvements in their schools.